John Adam Estes (Ripley, Lauderdale County, Tennessee 25 January 1899 or 1904 ? Brownsville, Haywood County,Tennessee 5 June 1977), best known as Sleepy John Estes or Sleepy John, was a blues guitarist, songwriter and vocalist. In 1915, Estes's father, a sharecropper who also played some guitar, moved the family to Brownsville, Tennessee. Not long after, Estes lost the sight of his right eye when a friend threw a rock at him during a baseball game. In 1915, Estes's father, a sharecropper who also played some guitar, moved the family to Brownsville, Tennessee. Not long after, Estes lost the sight of his right eye when a friend threw a rock at him during a baseball game. At the age of 19, while working as a field hand, he began to perform professionally. The venues were mostly local parties and picnics, with the accompaniment of Hammie Nixon, a harmonica player, and James "Yank" Rachell, a guitarist and mandolin player. He continue to work, on and off, with both musicians for more than fifty years. Estes made his debut as a recording artist in Memphis, Tennessee in 1929, at a session organized by Ralph Peer for Victor Records. His partnership with Nixon was first documented on songs like Drop Down Mama and Someday Baby Blues in 1935; later sides replaced the harmonica player with the guitarists Son Bonds or Charlie Pickett. He later recorded for the Decca and Bluebird labels, with his last pre-war recording session taking place in 1941. Estes made a brief return to recording at Sun Studio in Memphis in 1952, recording Runnin' Around and Rats in My Kitchen, but otherwise was largely out of the public eye for two decades. Though only modestly skilled as a guitarist, Estes was a fine singer, with a distinctive "crying" vocal style. He frequently teamed with more capable musicians, like "Yank" Rachell, Hammie Nixon, and the piano player Jab Jones. Estes sounded so much like an old man, even on his early records, that blues revivalists reportedly delayed looking for him because they assumed he would have to be long dead, and because fellow musician Big Bill Broonzy had written that Estes had died. By the time he was tracked down, by Bob Koester and Samuel Charters in 1962, he had become completely blind and was living in poverty. He resumed touring and recording, reunited with Nixon and toured Europe several times and Japan, with a clutch of albums released on the Delmark Records label. Though his later records are generally considered less interesting than his pre-war output. Nevertheless, Estes, Nixon and Rachell also made a successful appearance at the 1964 Newport Folk Festival. Bob Dylan mentions Estes in the sleevenotes to Bringing It All Back Home (1965). Many of Estes' original songs were based on events in his own life or on people he knew from his home town, such as the local lawyer (Lawyer Clark Blues), local auto mechanic (Vassie Williams' Blues), or an amorously inclined teenage girl (Little Laura Blues). He also dispensed advice on agricultural matters (Working Man Blues) and chronicled his own attempt to reach a recording studio for a session by hopping a freight train (Special Agent (Railroad Police Blues)). His lyrics combined keen observation with an ability to turn an effective phrase. Some accounts attribute his nickname "Sleepy" to a blood pressure disorder or narcolepsy. Others, such as blues historian Bob Koester, claim he simply had a "tendency to withdraw from his surroundings into drowsiness whenever life was too cruel or too boring to warrant full attention". Estes suffered a stroke while preparing for a European tour. He died on June 5, 1977 in his home of 17 years in Brownsville, Haywood County,Tennessee. Sleepy John is buried at Elam Baptist Church Cemetery in Durhamville, Lauderdale County, Tennessee. ".. ain't goin' to worry Poor John's mind anymore"
Sleepy John Estes' epitaph ".. ain't goin' to worry Poor John's mind anymore" was derived from his music. I Ain't Gonna Be Worried No More was recorded in 1935, and in his song Drop Down Mama, also recorded in 1935, Sleepy John refers to himself as "Poor John". Sleepy John's grave at Elam Baptist Church Cemetery in Durhamville is located off a country road and at the far end of the cemetery. His grave is adjacent to a small grove of trees, secluded but not hidden. 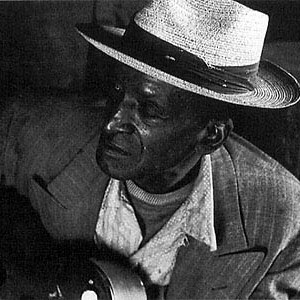 In 1991, Estes was posthumously inducted into the Blues Hall of Fame.